For a fruit fly, flying is just about everything. It is the most important innate behavior that helps the fly reach out to food sources and mates, escape predators, and find secure sites to lay eggs. But what gives the fruit fly its ability to fly relentlessly and reach out to your fruit bowl? A recent study from the lab of Prof. Gaiti Hasan, published in PLOS Genetics, has identified molecules that play a key role in this behavior. Flying, as many believe, demands tremendous energy. But did you know that the underlying basis for initiating and maintaining flight largely depends on the activity of neurons? Any visual, odor, or mechanical cue to a fly is perceived by peripheral sensory neurons, which then transmit this information to deeper brain centers. Specific neurons in the central brain of the fly respond to these stimuli and convey the messages further down to the central pattern generator that enables the coordinated action of flight muscles for flight. So, how long can flies fly? Under lab conditions, the authors have observed that tethered flies can fly on average for about 10 minutes, uninterrupted! This paradigm has been used to identify neurons and molecules that help maintain such long flight bouts and which could prove an advantage for the flies’ survival in the wild. The authors have discovered that a protein called the FMRFa receptor (FMRFaR) plays an important role in fly neurons to enable flight for long periods of time. FMRFaR resides on the plasma membrane of cells and is classified under a group of proteins called G-protein coupled receptors (GPCRs). GPCRs transduce extracellular messages from molecules such as peptides, hormones, and neurotransmitters into intracellular responses. What happens when a fruit fly lacks this protein FMRFaR? The authors found that flies mutant for the FMRFaR were unable to fly for long. In fact, these flies could only maintain flight for half the time as that of their wild-type counterparts. The question, then, is where exactly are these proteins present and what do they do. Just like humans, fruit flies have a variety of neurons in their brain that make different neurotransmitters for conveying information to each other. Among them are a well-known class of neurons that make and use dopamine for signaling. Dopaminergic neurons, as they are called, are known to affect behaviors such as learning, memory, and locomotion in mammals. 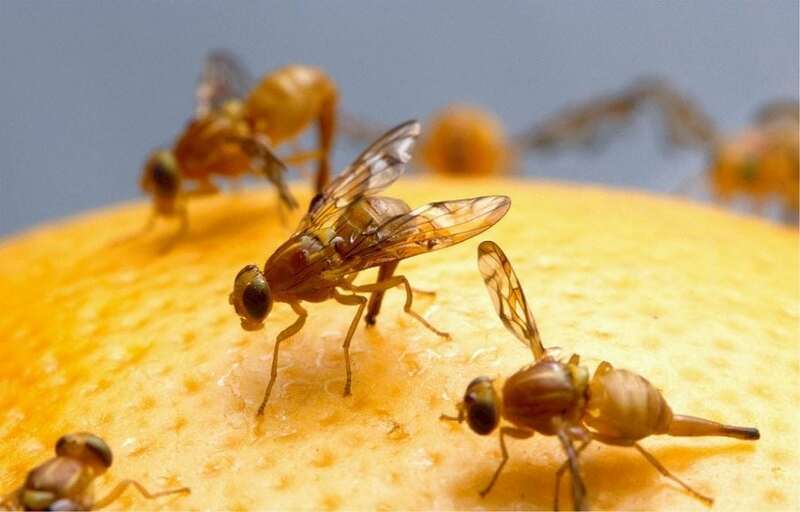 In the fruit fly, genetic experiments revealed that FMRFaR was present in mature dopaminergic neurons, and flies with neurons that lacked the FMRFaR in adults were only able to maintain flight for less than 3 minutes. 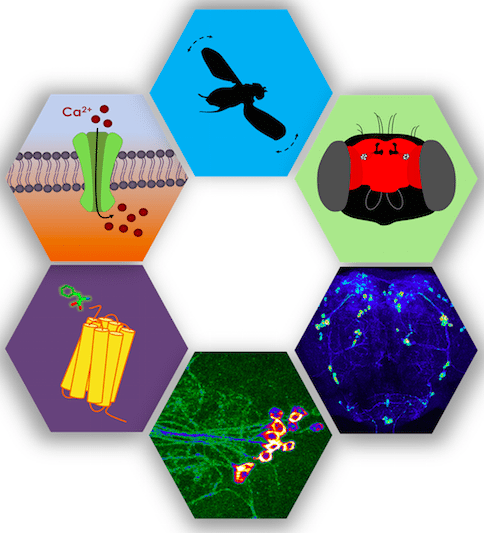 How does FMRFaR on fly dopaminergic neurons help sustain flight? FMRFaR, upon activation, initiates a signaling cascade within cells that elevates cytosolic calcium, a process required for regulating neuronal excitability. Neuronal excitability is the change in the membrane potential of neurons that occurs through the influx and efflux of ions such as sodium, potassium, and calcium. These changes depolarize neurons and stimulate the release of signaling chemicals called neurotransmitters that convey signals from a neuron to its partner neuron(s). Ravi et al. found that FMRFaR function is required in dopaminergic neurons to maintain optimal excitability. Loss of FMRFaR in mature dopaminergic neurons decreased their ability to depolarize as measured by fluorescence intensity of a protein that responds to changes in membrane potential. Conversely, when dopaminergic neurons lacking the FMRFaR were genetically supplemented with a protein that increased membrane excitability flies showed significant improvement in the duration of flight bouts. These findings demonstrated that the FMRFaR in dopaminergic neurons is required for regulating membrane excitability and thereby flight. The question that follows then is how does FMRFaR alter neuronal excitability? Stimulation of the FMRFaR results in the production of inositol trisphosphate (IP3), a small molecule, which binds to a protein present on the endoplasmic reticulum, named Inositol-trisphosphate receptor (IP3R). The IP3R is also an ion channel and upon binding IP3, it releases calcium from the endoplasmic reticular stores and thereby increases cytosolic calcium. This calcium can activate calcium-sensitive proteins. One such protein is the Calcium-calmodulin dependent Protein Kinase (CaMKII). Shorter flight bouts in flies with reduced CamKII function in dopaminergic neurons led the authors to speculate that CaMKII is activated in response to FMRFaR stimulation in neurons. Indeed, the flight deficits due to FMRFaR loss in dopaminergic neurons were ameliorated to an extent by over-expression of CamKII. They believe that the calcium elevation following FMRFaR activation stimulates CamKII that in turn either directly or indirectly influences channels on the plasma membrane that control neuronal excitability. Overall, it seems like the FMRFaR is at the interface of extracellular and intracellular calcium signaling in dopaminergic neurons and such signals help maintain the membrane potential of dopaminergic neurons in a state required for sustained flight. The identity of membrane channels that are sensitive to FMRFaR activation is still unknown. Though it is known that the FMRFaR is activated by a neuropeptide called FMRF, neurons that release FMRF and signals that stimulate FMRF release also remain to be identified. These findings are described in the article entitled FMRFa receptor stimulated Ca2+ signals alter the activity of flight modulating central dopaminergic neurons in Drosophila melanogaster, recently published in the journal PLOS Genetics. This work was conducted by Preethi Ravi, Deepti Trivedi, and Gaiti Hasan from the National Centre for Biological Sciences, Tata Institute of Fundamental Research. Preethi is a research scientist at the National Centre for Biological Sciences, Tata Institute of Fundamental Research. Gaiti Hasan is an Indian scientist who researches in the fields of molecular biology, genetics, neuroscience and cell signalling. Hasan is a Fellow of the Indian National Science Academy (INSA), the apex body of Indian scientists and technologists. 2013 onwards she has been serving as a Senior Professor at the National Centre for Biological Sciences (NCBS), Bangalore.